The Oppo Find X is the world’s first phone designed with a panoramic arc screen. The flagship device comes with a stunning display ratio of 93.8% and the AMOLED screen has a resolution of 2440 x 1080 (FHD+) with 19.5:9 aspect ratio.. Its screen-to-body ratio of nearly 94% beats popular widely available flagship mobiles like the iPhone X and Galaxy S9. At first glance there are also no cameras visible on the front or the rear of the phone. The stealth 3D cameras are not just hidden but contain a number of innovative technologies such as 3D Face Recognition system, front camera, rear dual camera and many intricate sensors. Under the hood of this phone is a high-end Qualcomm Snapdragon 845 SoC which clocks up to 2.8GHz. The octa-core processor is paired with a whopping 8GB of RAM and an Adreno 630 GPU. The Oppo Find X has an internal memory of 128GB or 256GB offering enough storage space for your favorite apps, music and videos. If the 256GB storage is still not enough for you then you should opt for the Lamborghini edition, similar to Huawei’s partnership with Porsche, with 512GB and a carbon-fiber textured back. One of the highlights of the all-screen phone are the slide-out cameras. Opening up the camera app will cause the phone's "Stealth 3D" camera tray to slide up, exposing a 25-megapixel front-facing camera and a dual 16-megapixel and 20-megapixel rear camera. It comes as no surprise that the pop-up camera tray is similar to the elevating selfie camera of the Vivo NEX Ultimate, which, along with OPPO and OnePlus, operates under the umbrella of BKK Electronics. There is no traditional fingerprint sensor on the Find X so it is unlocked via facial recognition. In this case, a mechanism at the top of the phone slides up to expose both the front- and rear-facing cameras. The 3730mAh battery of the Standard Edition is charged with VOOC fast charging technology (5V/4A). VOOC charging offers two hours of usage with a 15-minute charge. In terms of connectivity Bluetooth v5.0, LE, GPS with A-GPS, GLONASS and Beidou (BDS) as well as dual-band Wi-Fi (802.11 a/b/g/n/ac), are supported. It comes with Android 8.1 Oreo and Oppo's "ColorOS" skin, plus the phone will participate in the Android P beta. 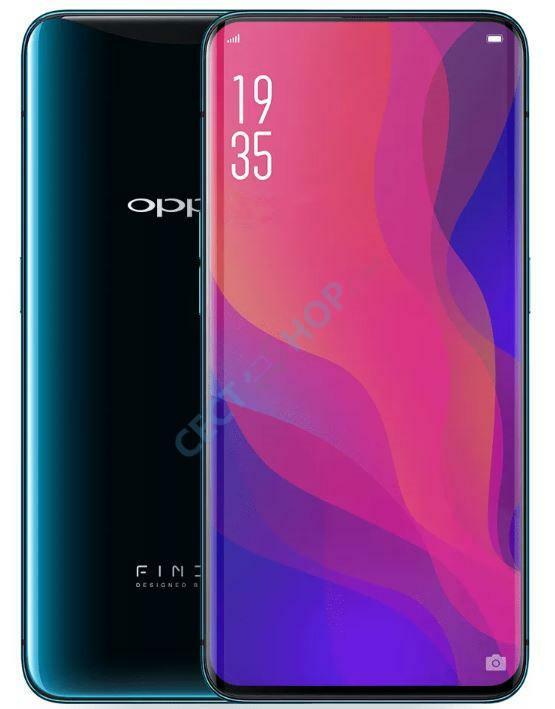 The Oppo Find X is available in Bordeaux Red and Glacier Blue. Get ready for the Oppo Find X with motorized pop-up camera! Order and buy the OPPO Find X online at CECT-Shop. Your trusted online store for China Smartphones and mobile consumer electronics since 2006.